The Doctor's Consultation: TB - is it still with us? Let us get one thing straight. Yes, TB is still with us, yes it is a dangerous disease, and yes, several thousand people die of the disease in Thailand. In fact, if you look at global figures, the number is around three million world-wide. It is also highly infectious. When you think back that 800 people died in the world from SARS, a disease that crippled tourism world-wide (and kept newspapers in business with the daily reports), and 3,000,000 die each year from TB, I get the feeling that we have our priorities a little mixed. Even the latest threat to mankind, the mutated Bird Flu (if it happens), is unlikely to claim that number of deaths in one year, let alone every year! TB is caused by a bug, and we have medication that can kill it in our bodies. The medications are not new breakthroughs, but a standard treatment therapy that has been used for decades. So why has it not worked? Dr. James Orbinski, a past president of the Medecins Sans Frontieres, said a couple of years ago, “In essence, tuberculosis today is a global public health emergency. It is a curable disease and yet two billion people are infected with mycobacterium tuberculosis. 16 million people around the world live with active tuberculosis, and a very significant percentage of those 16 million people are spreading tuberculosis. He also went on to say, “Only 25 percent of people who have tuberculosis are in active treatment programs which means that 75 percent of people with active TB are not in active treatment programs.” With those sort of statistics, you begin to see just why TB is getting out of hand. Even those who have TB and are put under treatment, rarely go through with the full course. The reason is simple. The course of treatment is somewhere between six to nine months! Research has demonstrated that the vast majority of people with TB will continue for two months, but after that length of time will most likely discontinue. So we have those millions of partially treated people who will not get better, and are capable of spreading the disease. For a disease that has been around for years, why are we working with such unwieldy, and outdated therapy? When you consider that a patient with TB is expected to take four different medications three times a day, and keep that up for nine months, the sheer logistics becomes a problem. Now factor in the cost. Since TB is rampant in the poor of Asia and Africa, are they likely to be able to afford the medication for nine months? Simple answer, No! It is probably high time that the researchers gave us something new, for a very old disease. Dear old Pater was delighted to find so many ladies in waiting as he whirdled forth with his shooting-stick. “There they were, woggling their grummitts,” chuckled Pater, “My splod was fairly bogled!” What Pater needs is a decent truss shop and a handmaiden, e.g., a Nok, Lek or Britney to “take care he.” Suggestions please Hillary. Suggestions? It’s too late for you and your father, I’m afraid. He should have trussed up and his dongel cut off before you were born. Then we would not have had to put up with your outpourings of lamentable value and lacking in any brillig thoughts. While I remember, whatever happened to the champagne and chocolates that you assured me were on their way three years ago, or was it even longer? I have been told that my Thai children cannot inherit my estate if I die. Their mother and I have been together for ten years, but we have never been married as I have a wife and grown up children back home. What is the situation as regards my Thai children? With what my friends are telling me, I am worried that in the event of my dying (I am 66 at present and the children are 8, 6 and 4) they will be left with nothing. I don’t have much, but the UK family is all grown up and can take care of themselves. Have you any guidance, Hillary? Take it out! Not yet, Petal. Not yet! There are a few things you have to do before you clamber in. First, have you made a will in Thailand? If you have not, then your family in the UK could have certain rights to your estate, which could out-rank your Thai children’s rights. There’s nothing like a good funeral to get family members scratching each other’s eyes out! On both sides of the world. To protect your Thai children, see an accredited Thai lawyer who will register your will in English and in Thai. If you really are that close to shuffling off then do it today! For that matter, do it today anyway - you might get run over by one of our multitudinous busses. The British embassy can advise you too. I congratulate you on protecting the welfare and future of your new family. This is a home decor problem, not a broken heart problem, so perhaps it’s something different for you. We are looking at buying some furniture for the bedroom, but when we go to the store and look at what is there, they tell us that we cannot take the actual wardrobe that we see there in the shop and want, as it comes in a kit form. I am hopeless at this construction sort of thing, and my husband not much better. Have you any answer for us? Or is it DIY lessons out here for everyone? You’ve definitely got hold of the wrong end of the screwdriver, Builder Barbara! Time you went to another furniture shop my Petal. You do not assemble the furniture yourself, but the agreed price will include delivery and assembly. If the shop you have been looking in doesn’t explain this to you properly, then it is time to find one that does not suggest you buy a full kit of screwdrivers as well. Hillary had some furniture delivered the other day and they assembled both in under one hour, cleaned the room afterwards and even took the packing away. I gave the men a small tip, I was so pleased with what they had done. (Only small, mind you, as on my salary I can’t even afford chocolates this week, and champagne is out of the question!). This is a fairly delicate problem and one that threatens to upset the entire family. My younger brother is going to come over for a couple of weeks in December and I just know it will be a disaster. First, every time he goes anywhere for “just a couple of weeks” he is still there one month later. He has a pension, so he doesn’t need to work, so that doesn’t take him away. He also criticizes everything I do and I also know he will bring women home, which is not the right thing to do in front of my children. How can I persuade him not to come? There are a couple of ways around this problem, Petal. First off, you can threaten to go away on holidays yourself. After all December is a good month to visit the rellies. You could always go and stay with him! You can ask some other friends to come over so there is no room. You can decide to redecorate and there will be no spare rooms without painters tarpaulins and ladders. Or you could do what you should have done many years ago - just say, No! You do say that you have children, so it’s not as if you are 12 years old. He may be the youngest in the family, but it’s time you just stood your ground. Do something positive. Time you took charge of your life. There is a great tendency for us all to take very ‘standard’ shots. By ‘standard’, I mean from a very standard viewpoint, so we end up with standard pictures. For example, when was the last time you took a photo that was not taken while you were standing and looking through the viewfinder? A long time, I am sure. However, when you take a photo from the standard position, you do get something that is instantly recognizable, because the subject of the photo is presented as we normally see that subject. We look up to see street lights, we look down to see children. All sounds boringly obvious. But it is that ‘normal’ viewpoint that can also make your photographs boring. I have mentioned before that when taking photographs of children, you should get down to be at the same level as they are. This way you will get a much more pleasing photograph of your little bundles of joy. However, when you are down on your knees you have also produced the situation whereby you can get some other different shots. These are a baby’s eye viewpoint of the world. Looking up at everyone and everything. It is well worth trying to take some shots of adults, or even the environment of the house. You will be amazed at just what your infants see! You may also be horrified when you see the dust under the computer table! While still in the ‘looking up’ mode, when you look higher than the ground floor shops, you may find there are some sights well worth blazing off a couple of frames. Even just washing hanging out can be quite noteworthy. Just try it. Remember too, that you get a distorted shot when you tilt the camera towards the sky. Buildings appear to lean over backwards, the trunks of trees look much more substantial than they really are. It is a kind of exaggerated perspective effect. Now ‘looking down’ can probably be even more rewarding, as this is a viewpoint that you never usually try (other than on children and lift wells). It also will present you with a kind of ‘helicopter’ view, that from that aspect alone, makes it very different. Look at the shot used this week. 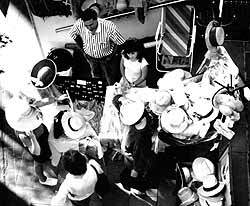 This was a weekend market and the shot was of a hat stall. You have to admit that the different viewpoint holds your imagination, more than a standard shot would have done. So since helicopters are expensive to hire, you have to start looking up first, before you can look down, and when you do this you will find there are many roosts for photographers who are training themselves to look at life differently. There are over-bridges, there are observation platforms, there are even hotels and condominiums with ledges and parapets. They are all there for you to use, after you have looked up to find them. What lens should you take? This is one of the rare times when I recommend a zoom lens. From the lofty viewpoint, it is difficult to predict what focal length you will need, and rather than taking several lenses up to the platform with you, the zoom can do it all. There is also the fact that if you go very high up (or even out of the helicopter), a Skylite 1A filter does help get rid of any altitude ‘haze’, but I would expect that most photographers already have the 1A permanently screwed on the front of the lens, just as scratch insurance. It is important that as you develop your artistic eye, you experiment with different viewpoints. Not all of them will be successful, but some will be, and the new viewpoint can be the catalyst for some unique art. And surely that is what many of us are trying to achieve. I personally believe that by applying some different viewpoints to some traditional Thai subjects you would produce some excellent wall art that could even have commercial possibilities. A trip around the local Wat, looking up and looking down, would be an interesting project for all photographers, from school age to old age. Try it this weekend (just don’t fall!). The scent hounds were originally bred by the nobility for hunting large game. They would follow a track, sometimes covering long distances. The hunters could easily follow the loud barking from the dogs. Once the game was found they would corner it, making it easier for the hunter to kill. A typical scent hound is droop-eared, smooth-coated, though some are rough-coated, and has a melodious voice. The coat color is often white with black and brown/red patches or only white with brown/red patches. For their task they usually need to run long-distances, resulting in long-legged dogs with agile bodies. Scent hounds usually work in big packs. Later, when people outside the nobility were also allowed to hunt and the habitat of large game shrank, fox-hunting and other small game hunting was included, followed by a selective breeding of smaller-types and short-legged scent hounds, such as the Beagle and the Basset Hound. This breed group comprises three sections: Section 1: Beater hounds, the largest group, tasked to beat down game, until the hunter is able to shoot it. The breeds vary in size, type of coat and color. Most breeds are specialized in just one game species in one specific terrain. 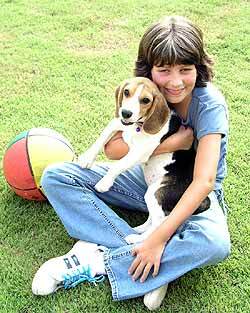 Well-known breeds are the Beagle, Basset Hound, Foxhound and the Bloodhound. Section 2: Tracker hounds, that will follow the blood track of a shot animal. Examples are the Hanover Hound and Bavarian Mountain Hound. Section 3: Related breeds to which the Dalmatian and the Rhodesian Ridgeback belong. A scent hound has a huge stamina, and thus, needs lots of exercise. Their hunting passion and scent abilities are very strong and there’s a great sense of independence, often resulting in some problems with obedience (especially the recall) as it rather follows its nose once outside. Therefore, the sooner the education of this type of dog is started the better. Most dogs are very social towards humans and their own species. Inside the house they usually are docile and attached. However, some breeds, like the Dalmatian and the Rhodesian Ridgeback do sometimes show territorial dominance - or fear-aggression towards their own people, strangers and/or other dogs. As real pack dogs they often have trouble staying alone, with some owners solving this problem by getting their dog a companion. And although some breeds are favored as pet dogs, even in present times, some of the scent hound breeds are still hardly suitable for such a life. One position that did not unfold as we expected last year was our preference for Japanese equities at the expense of those in the US. In fact, our preferred Japanese fund manager, Orbis, actually achieved better base currency returns in their global portfolio through their US listed shares than their Japanese ones, although that relative over-performance was somewhat offset by the benefit derived from the associated exposure to an appreciating yen. We believe, however, that this is more of a timing issue. Orbis’s company-specific research continues to conclude that their Japanese holdings offer prospective long-term returns that are no less attractive than those in the US but with less risk of permanent loss of capital. Thus while Japanese shares may struggle to keep pace with strongly rising global equity markets if there is any continuation of the short term liquidity boom (which is looking increasingly unlikely) we believe they will help reduce vulnerability should the global environment for equities become less buoyant. This is a key component in the way that investments are evaluated at MBMG - the potential return for each unit of risk. While this leads to some extremely complex matrices, it provides a focus on earning superior long-term returns while minimising exposure to the risk of permanent loss of capital. Clearly this isn’t always straight forward - one example that our commodities researchers have highlighted is a number of opportunities amongst selected South African focused resource companies (such as the gold and platinum miners) whose earnings and share prices have been significantly impacted by the persistent strength of the South African rand versus major international currencies. These companies effectively earn their revenues in dollars and incur a substantial portion of their costs in rand. As a result, the earnings of these companies are significantly positively geared to a weaker domestic currency and several of them can be acquired on attractive multiples assuming a more normal level of earnings. While there is a growing consensus within South Africa that the rand is likely to remain strong or get stronger, we do not share this view and believe that there is risk of weakness from these levels. Canon Sales, which constitutes our biggest Japanese stock exposure, is typical of the Japanese shares we find attractive. From a macro standpoint, shares in Canon Sales, which is the distributor in Japan for its renowned multinational parent, Canon Inc, are favoured as Canon Sales’ earnings have been hurt by the long-depressed Japanese economy - at least until very recently. By contrast, Japanese multinationals have prospered for many years from buoyant economies outside Japan. Furthermore, the domestically focused Canon Sales is unaffected by the strengthening yen. Fujio Mitarai’s appointment as president of Canon Inc in 1995 subsequently transformed that company’s profitability. At Canon Sales, we expect President Haruo Murase’s appointment in 1999 to do likewise, but in this case we believe the improvement in profitability is only just beginning. Despite the share price of Canon Sales appreciating 61% to ฅ1,531 in the 6 months since we first acquired exposure, the share price only now approximates the underlying tangible net asset value per share of ฅ1,533. Canon Sales’ balance sheet is pristine with no less than ฅ591 per share in cash and cash equivalents net of all debt, representing 39% of shareholders’ equity. With bank deposits in Japan yielding zero and 3-year government bonds yielding only 0.24% pa, this 39% of assets in net cash earns nothing. Clearly if these excess financial assets were returned to shareholders, return on the company’s reduced equity would nearly double in one fell swoop. A more reasonable expectation, now that confidence is gradually returning to management in Japan following the traumatic bursting of the bubble that began in 1990, is a higher dividend payout, redeployment of excess financial assets into growing operating assets both from internal growth and through acquisitions, perhaps some buybacks, and no dilution from new share issues. Western companies and their shareholders have long benefited from such soundly implemented “financial engineering”. These benefits still lie ahead for many cash-rich Japanese companies, including Canon Sales, with market leaders such as the Toyota Group showing the way. Management - conservatively we believe – expects a 5% return on equity in 2004 which translates into a 9% return on the remaining 61% of shareholders’ equity not in cash but actively employed in the business. We expect earnings growth to exceed expectations as profit margins are boosted by the transformation of Canon Sales’ important business solutions division with networked printers, copiers/multifunctional printers and the shift to colour printing. A small loss was realized last year with a very small position shorting Japanese Government Bond (JGB). Although JGBs were the worst performing of any major government bonds globally in 2004, both Japanese long-term and short-term borrowing costs have remained lower for longer than had been expected. In order for short JGB futures position to provide a positive return, Japanese interest rates must rise (causing a drop in bond prices) by a greater amount than the market had expected. Despite the lacklustre performance of this small position last year, we continue to hold the short JGB futures position because of our conviction that the yields on JGBs are too low in relation to prospective economic activity and perceived future inflation. One reason why the JGB yields have not risen in line with stronger economic activity is the program of continued JGB repurchases by Japan’s central bank, which pumps cash into the system and supports the JGB prices, in the hopes of further stimulating economic activity through increased money supply. The current policy stance of the Bank of Japan (BOJ) is to continue buying back JGBs until a neutral or inflationary environment prevails. Inflation in Japan had been negative for some years, but has been running just shy of zero for some time now. In our opinion, the BOJ’s repurchase program in the face of continued signs of underlying economic growth only prolongs the eventual adjustments in bond yields needed for the new higher levels of economic growth and inflation expectations. It should also further increase the likelihood and magnitude of an eventual interest rate move that will ultimately benefit the short JGB position. I own two big bikes. “Big” means “Been In Garage” eight months for repairs. A riding addict, I’m now at the mercy of rental companies. They keep my passport while I spend excessive amounts of cash and never know if the bike will run. (Hmm. Having my own bikes is exactly the same, except I get to keep my passport.) Before this bike trip I rent a Super Four, fill it with petrol, go to bed at 8 p.m., rise at dawn for yoga and final preparations for an uphill ride through northern Thai mountains. By 7:30 a.m., the day goes downhill. A good friend needs a jumpstart for his dead bike. I arrive at 8, but he’s in another time zone, having a sandwich and beer for breakfast. Conversation, jumping and a couple of errands sets departure time at the crack of 11. I’m way behind and haven’t started yet. My last task is to fetch my scarf hanging in a tree. As I grab it, the stinging begins. I see a red ant and brush my body with the scarf. The stinging persists and my riding mate (who is absolutely terrified of snakes but we’ll get to that later) searches under my shirt for more ants. None. Okay, fine, I’m hot, sweaty and in agony. “Let’s ride. I’ll cool off and feel better.” Not. 30-some miles out of Chiang Mai in some miscellaneous jungle, the engine stops. As I try to start the bike with every combination of choke, throttle, tick-over, push-start and swear word I know, my partner scratches, itches and breaks out in a painful rash, the same one that now covers my neck, back and arms and has turned my skin into a mountain range of burning welts. Did the ants spawn vicious babies under my skin? Did I touch some lethal Thai poison ivy? Is last night’s Fire Curry seeping out of my pores as poison? The sun is melting the asphalt highway and our hair. The itching blisters are reproducing. We’re out of water. As my friend screams on the mobile phone at the rental staff who keep repeating “Gas? You get gas? You have gas?” and have lost the ability to understand Thai or English, we hear a substantial ‘thunk’ next to the bike. My mind assumes “palm branch hit the ground”, but my eyes say “five-foot snake just landed on the road.” My friend’s screams move up one octave. Personally I’m not afraid of a snake clumsy enough to fall out of a tree. Even if it did try to jump us, it missed by two meters. It probably broke a few ribs, but having 300, he slimps (contraction of slither and limp) into the ditch. At the stroke of two, just before a sun stroke, friends arrive and start the bike immediately, making me feel like spit (Stupidest Person In Thailand). The Rental Nazi finally brings another bike after scouring northern Thailand looking for the exact mileage marker on the exact road we gave him. Original schedule scrapped, we scratch our way to Malee’s Nature Lovers Bungalows in Chiang Dao and learn about our disease: “Caterpillar hairs, like my son get, itch all over. Take medicine.” Great. Not only did I contact major caterpillar hairs, I beat them into my skin with a scarf and then infected my mate. 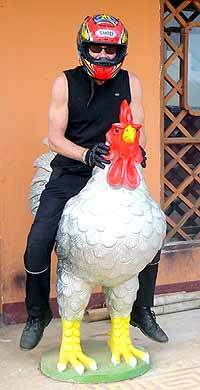 I trade in the bike for a chicken. It wakes me in the morning, eats caterpillars and snakes for fuel, and I can eat it when I’m done riding. If I ever get back to America, I’m going to sell caterpillar hairs to the military.